It started two weeks ago as an exploration of a new engine, for our own gratification. We’ve been developing for the last two years using an ogre based engine Reinan built. But recently Epic Games has made their Unreal Engine available to developers at no up-front cost. So we thought we’d check it out. Now, after two weeks of prototyping in Unreal, and lots of grumbling from Reinan, we’re pretty happy with what we’re seeing. 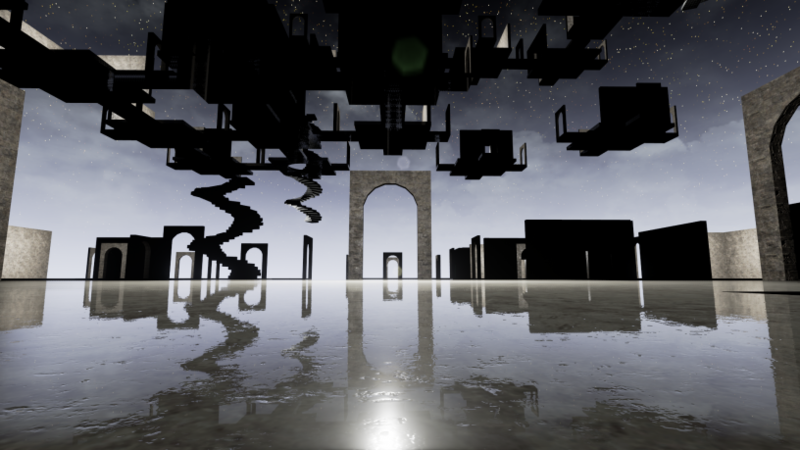 “UE4 is a post-process zoo,” says Reinan, between complaints about ‘Blueprint,’ UE4s visual scripting interface. Being good at regular code makes visual scripting systems like Blueprint feel slow to him. That’s not surprising, the visual systems are designed for artists like me to be able to accomplish tasks normally reserved for programmers. A random sample of cobwebbed logic and data nodes in Blueprint. Blueprint gives me far more power than I had before. I can design basic play mechanics and events – like give the character a new ability, or set up a scene to play out at a particular moment, or change how the character moves. Most of these sorts of tasks would have had to be handled by Reinan before, or in collaborations that demanded his time. Now have to I ask him to do things way less often, but the things he does on his own are accompanied by some grumbling. When he talks about post-processing, he means the screen effects like lens flares and motion blur which are handled after the basic geometry of the scene has been rendered. Reinan has a special fascination with cutting edge techniques in post-processing. If left to his own devices, he’ll default to finding creative ways to make the game look really good. I find this an acceptable habit. The zoo remark means he’ll probably rewrite all of the default post-process effects in Unreal. That’s fine. We can make them better. Now we grapple with the question of whether to return to our last project, or move on with this prototype and consider polishing it to a finish. Either option is a roll of the dice, but at the moment, we’re feeling good enough about the new prototype to open up a 2010 bottle of Goose Island’s Sofie, a Belgian style bottle-aged ale Reinan’s been hoarding since the date on the label. “That’s five years of patience you’re drinking,” Rainen says. It’s amazing to think we’ve only been working on this project for two weeks.